To compare short-term clinical outcomes between scleral-fixated and transscleral suture-fixated intraocular lens (IOL) implantation. A retrospective, nonrandomized, comparative case series. 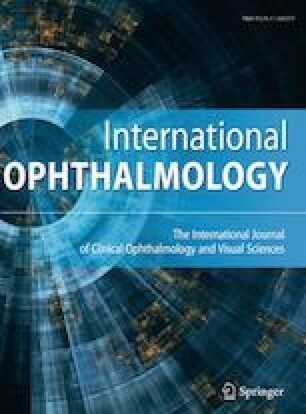 Eighty-nine eyes of 87 patients were included in this study; 45 eyes underwent transscleral suture-fixated IOL implantation (group 1), and 44 eyes underwent scleral-fixated IOL implantation (group 2) between February 2009 and June 2017 in the department of Ophthalmology, Hiroshima Prefectural Hospital, Japan. The postoperative best corrected visual acuity (BCVA), degree of astigmatism, IOL astigmatism (total astigmatism–corneal astigmatism), and refractive error were all measured at 1-week and 1-month intervals. The mean preoperative BCVA in logarithm of minimum angle of resolution (log MAR) was 0.39 ± 0.56 and 0.46 ± 0.51 in groups 1 and 2, respectively, and the mean postoperative BCVA was 0.25 ± 0.41 and 0.34 ± 0.49 at 1 month. The postoperative degree of astigmatism in group 2 was significantly less than that in group 1 at 1 week and 1 month (p = 0.0046 and p = 0.021, respectively). The postoperative IOL astigmatism in group 2 was significantly less than that in group 1 at 1 week (p = 0.021), while the refractive error between the two groups was not significantly different at 1 week or 1 month. Scleral-fixated IOL implantation has equivalent BCVA and refractive error outcomes as transscleral suture-fixated IOL implantation during the early postoperative period without serious complications. Scleral-fixated IOL implantation appears to provide more stable fixation than suture-fixated IOL implantation.